You know who they are...Cat Lovers! 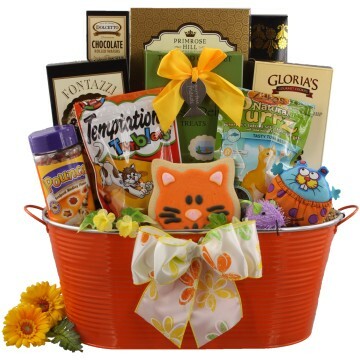 Send a Cat and Owner Gift Basket that includes treats for the cat and snacks for the owner. These combination Cat & Owner Gift Baskets make excellent gift ideas for cat lover birthday gifts, thank you for the hospitality gifts or maybe as a corporate gift for the Cat Loving boss. included with all of our Cat & Owner Gift Baskets! Smiles and Purrs Cat and Owner Gift PackageNeed to send a gift for someone who loves their cat? Send them a gift they can share! Our Smiles and Purrs Cat and Owner gift is sure to please as it comes with treats for the owner and a fun crinkle ball cat toy for fluffy. This gift would be perfect for get well, birthdays, gift for appreciation, and thank you and more. Many Thanks Cat & Owner GiftThank you gifts are a great way to display your appreciation but to send a friend, neighbor or business associate or client a cat lover gift for appreciation becomes a very noticeable gesture of appreciation and your recipient now realizes that you know their kitty is special to them and a vital part of their family as well. Warm Wishes for Cat & OwnerOur Warm Wishes Gift for Cat and Owner gift is an awesome way to send a great gift and include the family kitty as well. Let them know you understand their special connection of being a pet parent and that they would love to share their gift with kitty too. This pet lover gift is perfect for almost any gifting occasion, even corporate! Purr-fect Cat & Owner Gift BasketSend a gift they are sure to remember. Our Purr-fect Cat & Owner Gift is filled with delightful gourmet treats for the kitty’s owner and also treats and toys for kitty. Pet owners are always appreciative of those who send gifts but they are very excited when a gift arrives with treats for their beloved kitty as well. Happy Day Cat And Owner GiftCelebrate their achievements with our Happy Day Cat Gift. A delicious assortment of goodies can be found inside this bright and sunny gift for both the owner and her cat. It all begins with an adorable sunshine yellow polka-dot handled tin which holds a delightful assortment of goodies along with an adorable flower notepad with matching pen. Send greetings of accomplishment or encouragement with this pet lover gift as it is very versatile for any gifting occasion for her and her kitty. Treats and Cookies Cat & Owner GiftSend your personal greeting along with this fabulous cat and owner pet lover gift. Purr-fect gift to send for either a kitty or his/her owner because inside this pet lover gift is treats for both of them. Kitty is sure to enjoy cat treats and a catnip toy while the owner enjoys their own assortment of sweets and treats and the container is a tin with handles and is large enough to be reusable for a multitude of possibilities. Our pet lover gifts are wildly popular as the gifting possibilities are unlimited!